Home » Blogs » My Meds, My Self » Could Meds Make It Harder To Take the Heat? New York, like much of the country, was mired in a massive heat wave for much of this week. 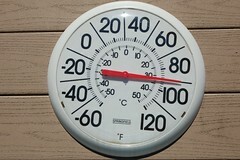 Everyone was complaining that they could hardly stand to go outside – the heat index was 100 degrees. Once high temperatures set in, I began feeling particularly faint and achy, like I was getting sick. At first, I figured I was about to get a migraine, since I often feel like this before a particularly bad one. But no big headache arrived. Then I figured I was getting the flu. But I didn’t have other symptoms, like a sore throat or an upset stomach. And then, I read an article online from the Philadelphia Inquirer about how heat and certain medications affect how well the body can regulate its own temperature, making people who take them more susceptible to extreme heat. I knew that people who take lithium as a mood stabilizer have to be careful in the heat. The drug has has a narrow therapeutic range and can reach toxic levels in your system if you get dehydrated, something that’s much more likely to happen in hot weather. But it was news to me that other psychiatric drugs, including the antidepressants I take, could alter the body’s ability to regulate its temperature. I’ve been taking antidepressants since I was 17 – and for a long time now I’ve also been particularly sensitive to extreme heat. I can’t remember if my heat sensitivity predated my meds. But this article made me wonder if I might be feeling worse than usual because I recently added an older antidepressant that’s supposed to help with migraines. Both the newer antidepressants I’ve taken over the years – including Prozac, Zoloft and Wellbutrin – as well as the older drug I recently began taking, Pamelor, are listed here as affecting the body’s ability to regulate temperature. This pamphlet, though it comes from the director of Ohio’s department of mental health, is not exactly authoritative scientific evidence. My reporter’s curiosity, not to mention a weakness for researching my own suspected medical issues online, tempted me to delve further into the scientific literature. I already knew that many medications, including psychiatric ones, have what are called anticholinergic effects – they interfere with the transmission of certain nerve impulses that regulate mucus production, digestion, heartbeat and other bodily processes. What I didn’t know is that one of these bodily processes is sweating. The so-called tricyclic antidepressants like Pamelor decrease sweating, which in turns makes it harder for the body to cool itself down and makes it less able to respond adequately to high temperatures. And then I remembered a fascinating article I read a couple of days ago about the “nocebo effect” – the tendency for people to experience side effects from drugs solely because their doctors or medication warning labels have planted the idea in their heads. Researchers know this can happen because subjects in clinical drug trials sometimes experience side effects they’ve been told may occur – even when they are not actually taking the active drug, just a placebo. Another means of having the idea of drug side effects planted in your head? Reading well-meaning cautionary news articles, like the one I read about heat and medications. Or doing too much informal medical research online and developing cyberchrondria – concluding you’re suffering from awful diseases or drug side effects that are actually incredibly rare. Granted, I started feeling crappy two days before I read the article about heat and medications. But might reading it, and then supplementing it with online research, have exacerbated my symptoms? Or had it just led me to a false conclusion that my meds were to blame? After all, everyone was feeling awful in this heat. Or maybe I was getting the flu or about to get a massive headache. I wanted to forget about the whole thing and say it didn’t really matter why I was feeling under the weather, so to speak. After all, whether I was just feeling the heat like everyone else, getting the flu, about to get a migraine, or feeling extra-weird because my meds affected my ability to handle the heat, I probably needed to pursue the same strategy: take it easy, try to stay cool, and drink plenty of fluids. And as much as I felt the urge to indulge my curiosity and do more research, I wanted to avoid being a cyberchondriac. So I tried to be reasonable: I cut myself off from more research and asked my pharmacist if I might be feeling weird because of my meds and the heat. He said he’d look into it, then called me back the next day to confirm what I’d learned about anticholinergic effects of drugs like Pamelor. He said to try to stay cool and stay hydrated. The irony is not lost on me, meanwhile, that writing this blog post may make some of you unduly worried about psych meds and the heat. If you’re inclined to research it – or if you’re a health professional or scientist who can provide a good layman’s explanation – feel free to post your findings in the comments section. Or just weigh in about your own nocebo or cyberchondria experiences! Bipolar disorder and suicide: Where did medication fit in?